Here is a very easy recipe to put together for a quick lunch or snack. Or, double the recipe to take to a party when you’ve been asked to bring a finger food. 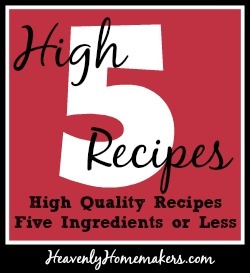 What kinds of High Five Recipes are you interested in seeing more of? Main dishes? Side dishes? Desserts? Does the taste of the hamburger meat strong in the dip? It’s not very strong. You could sprinkle some chili powder on it while cooking if you want it stronger. This sounds so good!! Thanks for sharing! Do you serve this cold? Maybe a dumb question, seems odd cold ground meat but I want to try it. Every fourth Friday, I need to bring in a little nosh for our department. This has been going on for 5 years. I am always on the look out for something different. I usually serve it right after stirring the salsa and sour cream into the hot meat, so I guess it’s kind of lukewarm. I LOVE beef any which way, so I guess I never thought of it being a little odd…but you’re right! Even if it’s cold by the time you serve this, I think it would be just fine! Hubs makes a similar dish with the addition of cheese. It’s very yummy and popular with guest.